Inside this containment area we set up an Air Scrubber to make sure and clean the air as we cut and removed a small spot of mold from the ceiling. This little spot of mold created a larger area of drywall to be removed. In the picture you see a 3" spot but on the other side of the sheet rock it grew to 8" wide. This mold was found when a pipe leak had to be fixed in the ceiling. 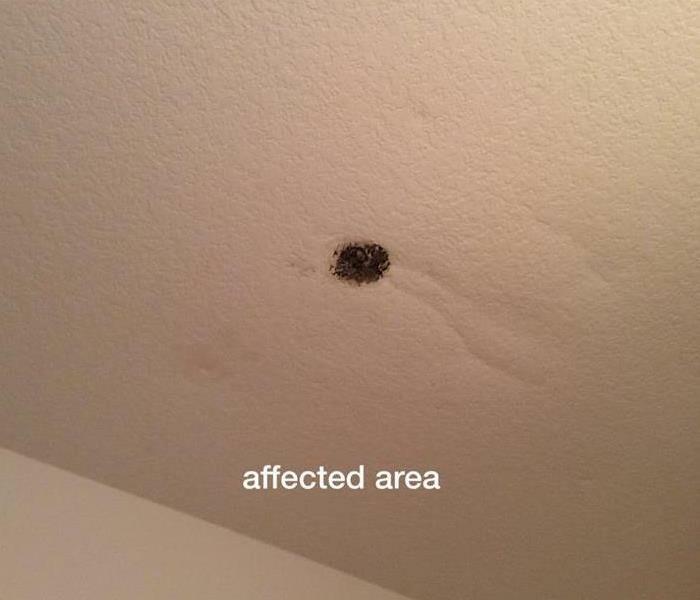 There was enough moisture in the space that caused a patch of mold to grow within days. If your home is damaged in any way from a storm, SERVPRO of South Austin can help clean up the mess, dry your house out and get it back to a livable state. This office building was the result of a small storm serge that happened to flow water down a hill, through a small valley and into the open bay door. SERVPRO of South Austin was able to dry it out in 2 days! 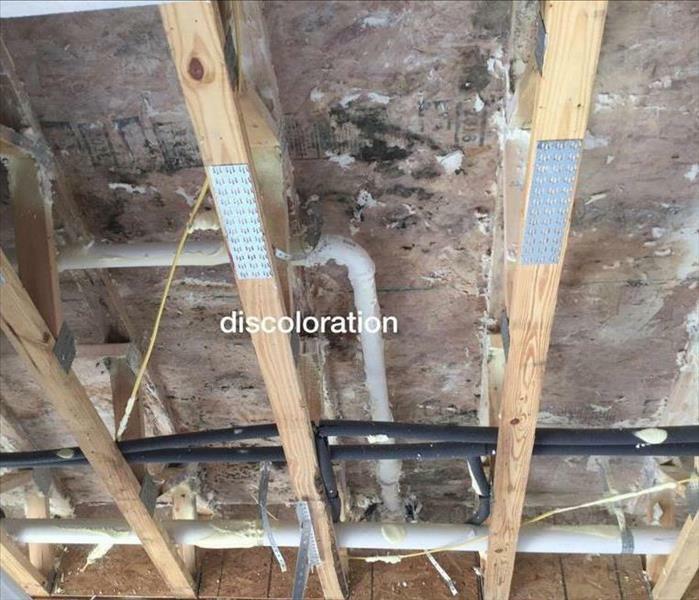 Our technicians were able to extract the mud and water from this house and remove the lower half of the drywall to stop the moisture from spreading. The homeowner was thrilled with the outcome! 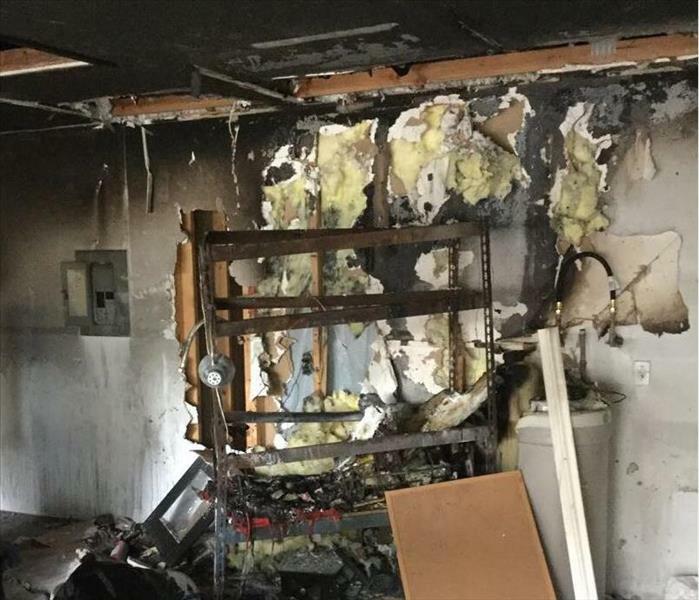 This fire occurred in an apartment complex. Fortunately only one unit was affected. We did a great job of going in and cleaning up the debris and making it "Like it never even happened." This was the aftermath of a fire that started in the garage. Even a small fire can create a large amount of damage when the firemen come in to put it out. The builders of this unfinished business office were very upset to find a water leak that happend over the weekend. Luckily we were able to dry it out quickly so they could resume construction. 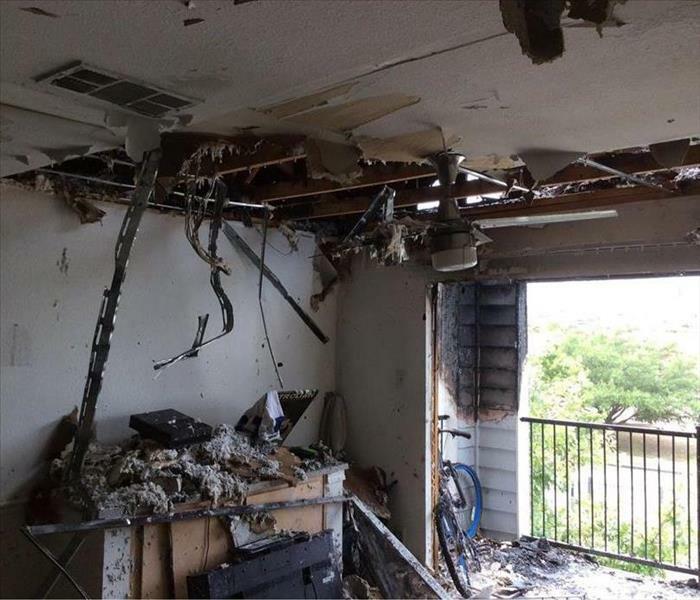 A water leak at this North Austin apartment complex affected 16 apartments and 2 floors. 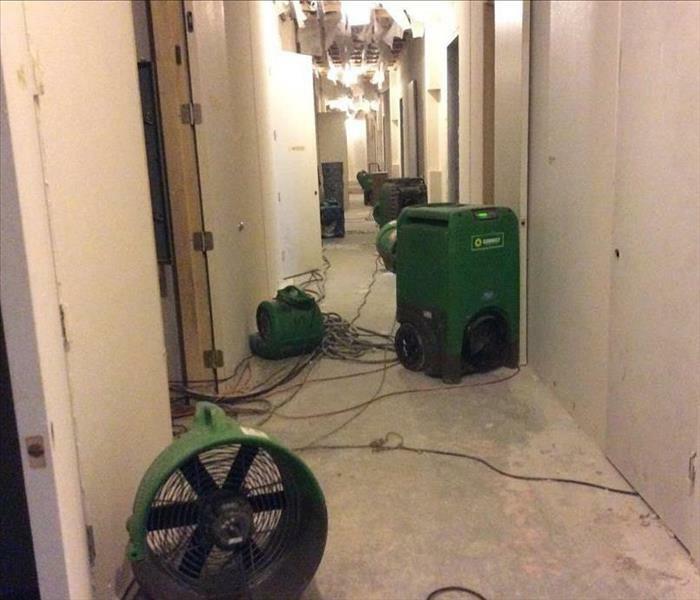 Our technicians had to set up drying equipment in each room of each apartment. That's a lot of fans! 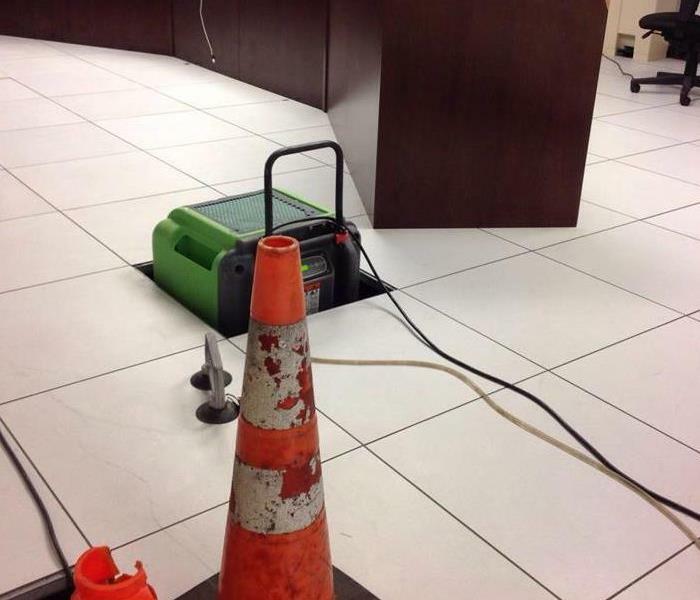 A broken water pipe flooded the lower level flooring in this computer room. Our crew was able to remove a few of the panels and strategically place a dehumidifier and a few fans to dry it quickly. This commercial kitchen needed a complete cleaning makeover. Our cleaning crew had to clean the ceiling, walls, floors, walk-in freezer and all the cook tops and fryers. It looked like new when we were done! This was the aftermath of a strong storm serge. 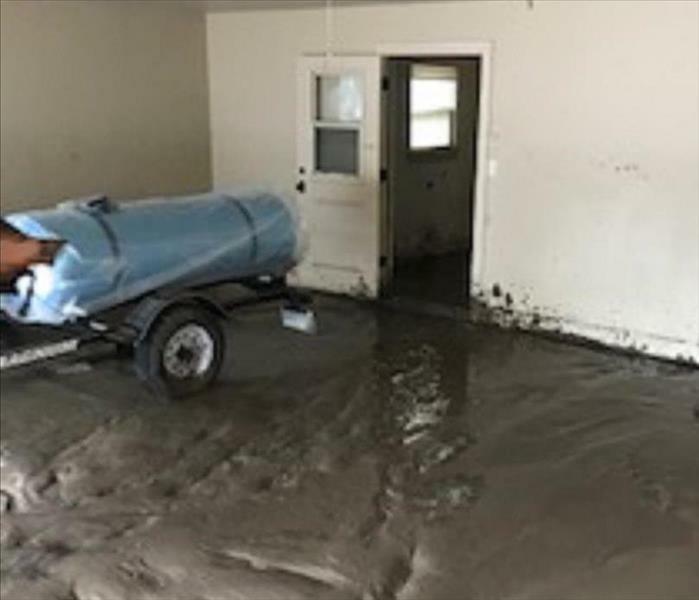 The mud flooded the living room, kitchen and garage in this home. 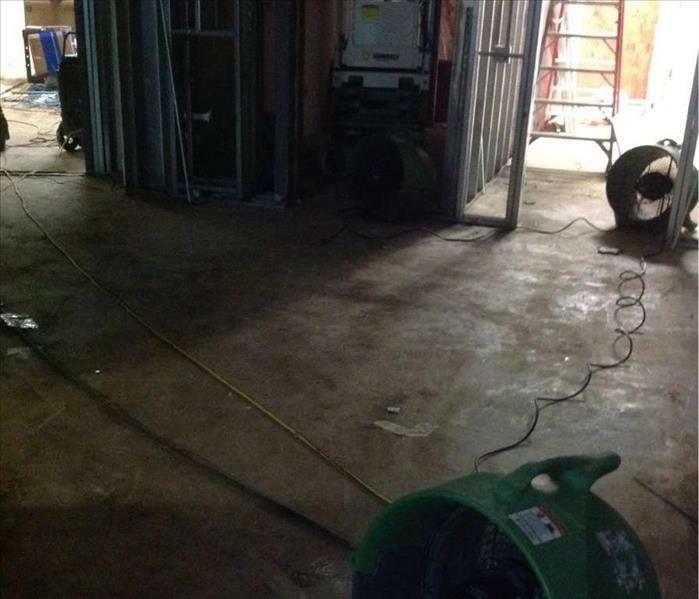 After the mud was removed, we set up dehumidifiers and fans to thoroughly dry it out. The smoke from this fireplace engulfed this home because someone forgot to open the flue. 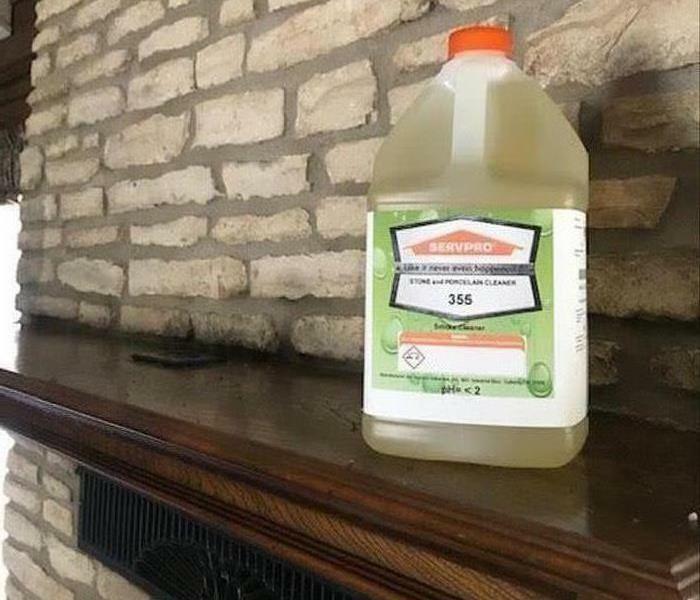 Our cleaning crew used one of our Green Cleaning Products to wipe the walls, cabinets and floors down. 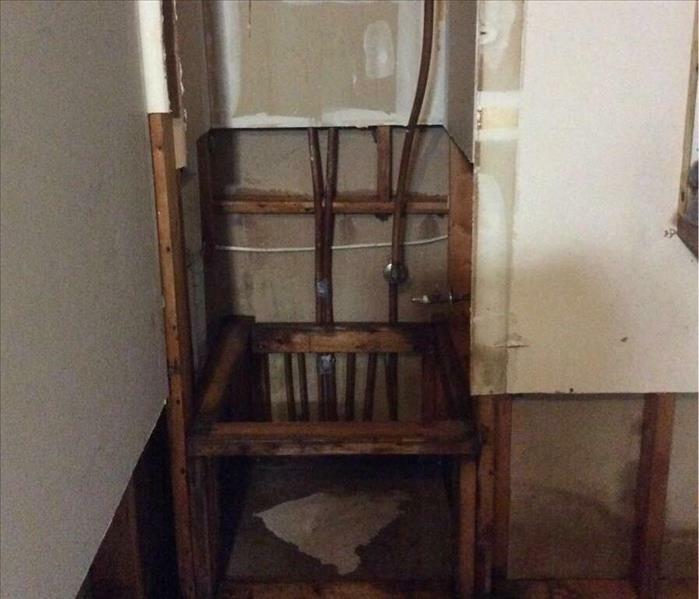 This water heater leak caused moderate damage in this home in South Austin. Our trained technicians assessed the damage and went right to work drying out the rooms affected. 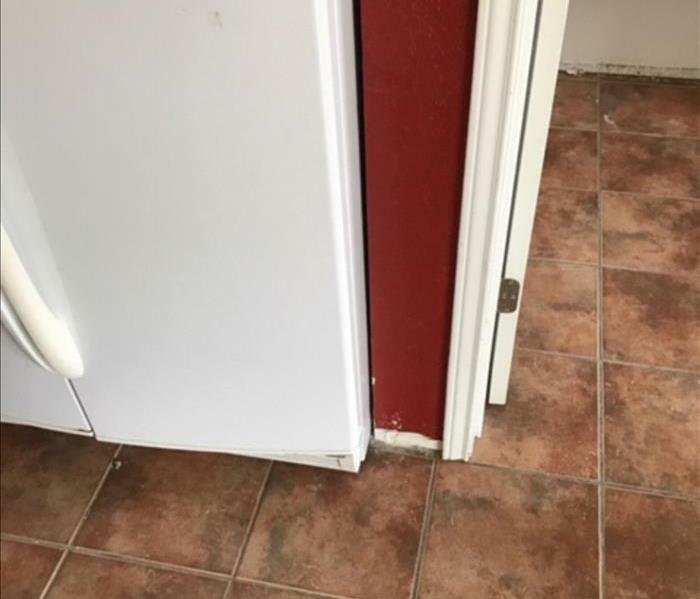 SERVPRO of South Austin specializes in baseboard removal. Austin, Texas is known for it's low water areas of town. We can come in and asses what is the best method to help dry it out. 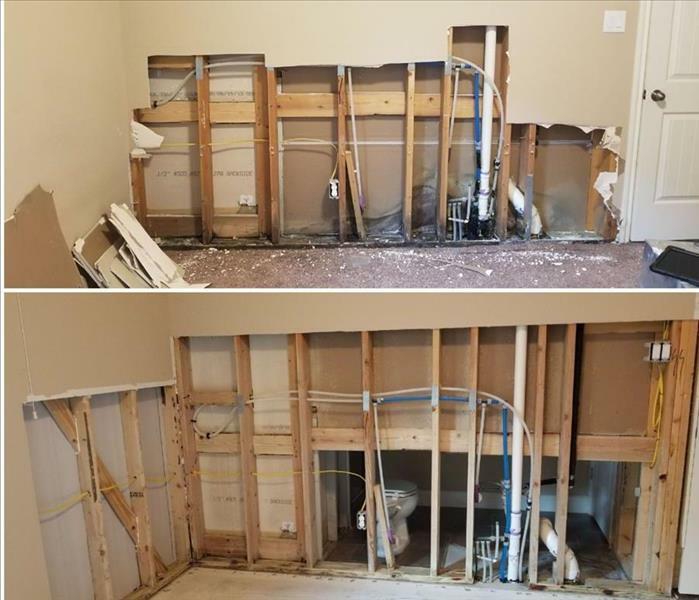 This is a before and after photo of when the plumber cuts the wall (top) to find the leak and turn it off. SERVPRO then comes in and straightens it out (bottom). 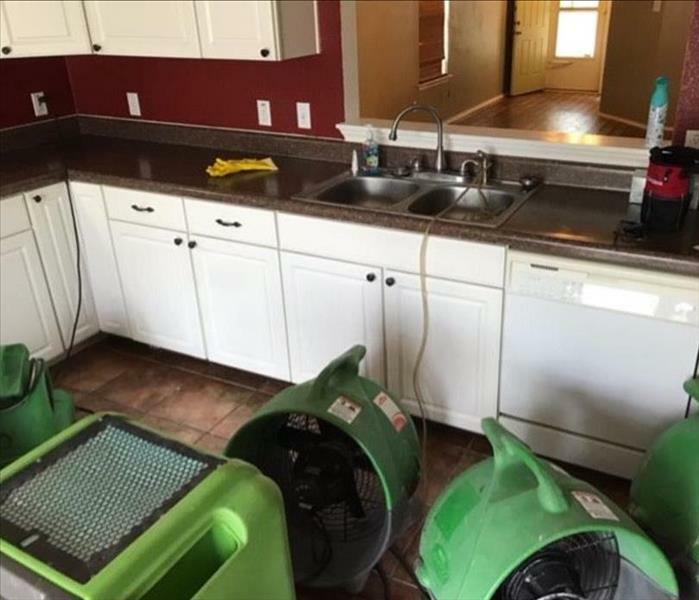 SERVPRO of South Austin pulled out many fans and dehumidifiers for this South Austin kitchen. 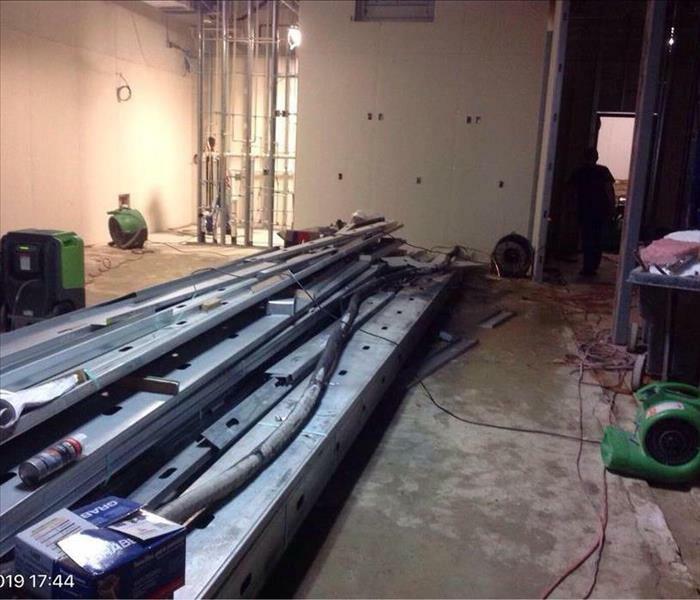 Our technicians know the quantity of equipment per size of the room or house. They also know how to maximize drying time. SERVPRO of South Austin works to figure out what will help a room to dry quicker. 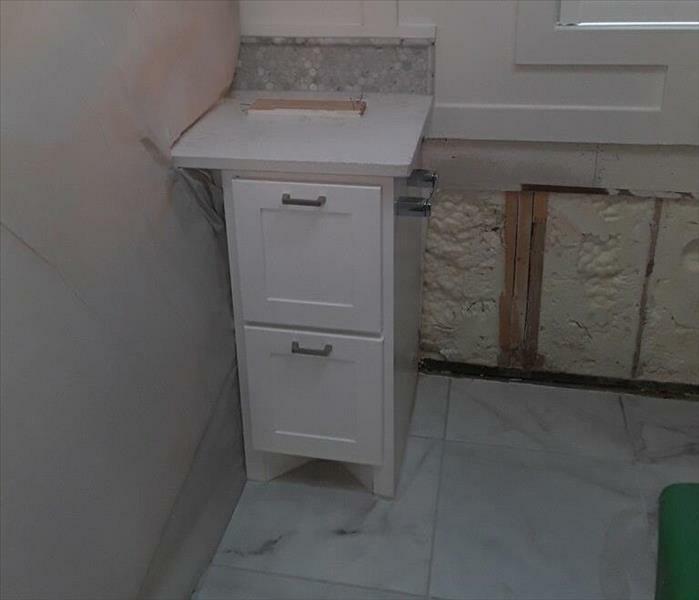 In this bathroom photo the covered the left wall and floor so the wet wall could benefit more. Safety and cleanliness are important to us when removing mold or debris from an area. Our crew are experts when it comes to containment. After the devastating wildfires in Bastrop, TX, Extreme Makeover contacted SERVPRO of South Austin to help one family rebuild their dream home. Here's our crew on the scene to make fire damage "Like it never even happened"!!! Have you ever seen such a cool car to make sales calls in? We love our new wraps showing how we make fire and water damage in Austin "Like it never even happened." See you around town! 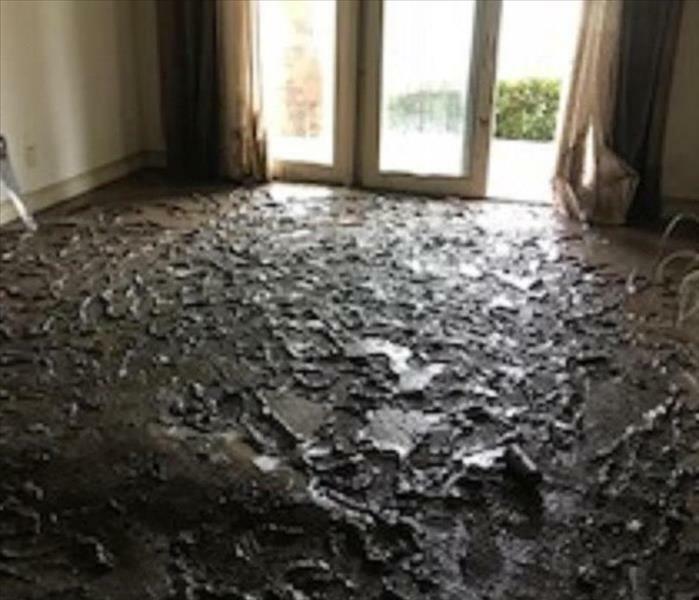 SERVPRO of South Austin was called out to the Dell Diamond in Round Rock after experencing a major plumbing leak under the slab causing major water damage in Round Rock. Commercial water damage at the Dell Diamond in Round Rock. The entire Heritage Center and banquet rooms were affected and had to be dried out. SERPVRO specializes in commercial cleanup. Water damage to the slab at the Dell Diamond in Round Rock requires plumbers to dig up the slab and lots of dirt to access the plumbing. The reason why this air mover is superior in design is simple. In order to maximize drying, high velocity air has to be blown across the wet surface to help move the water into the air and circulate it so that it can be dehumidified. This is the only product that actually focuses the air at the floor, and the only product designed to dry the hardest area, where the floor meets the wall. 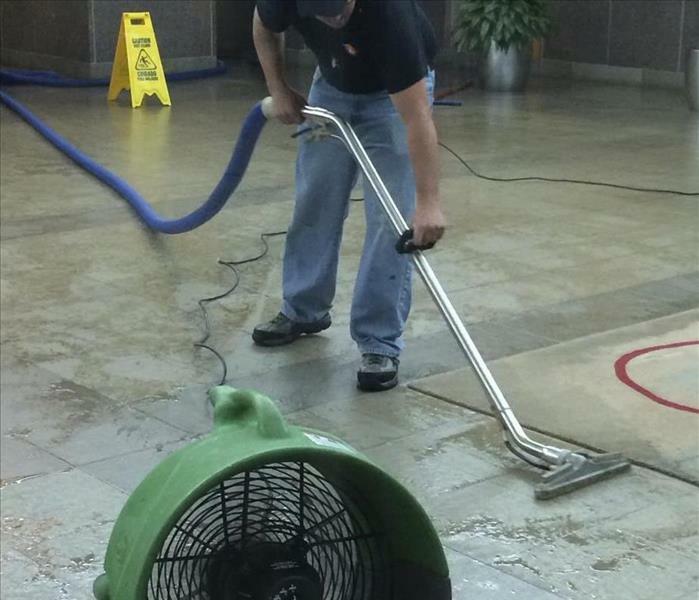 This is a SERVPRO crew member cleaning up water next door to a restaurant whose commercial kitchen had an overhead pipe that burst. It was "raining" in the kitchen and filled the floor with inches of water in just seconds, and it spread under the wall to the office space next door. SERVPRO of South Austin is proud of its company awards! 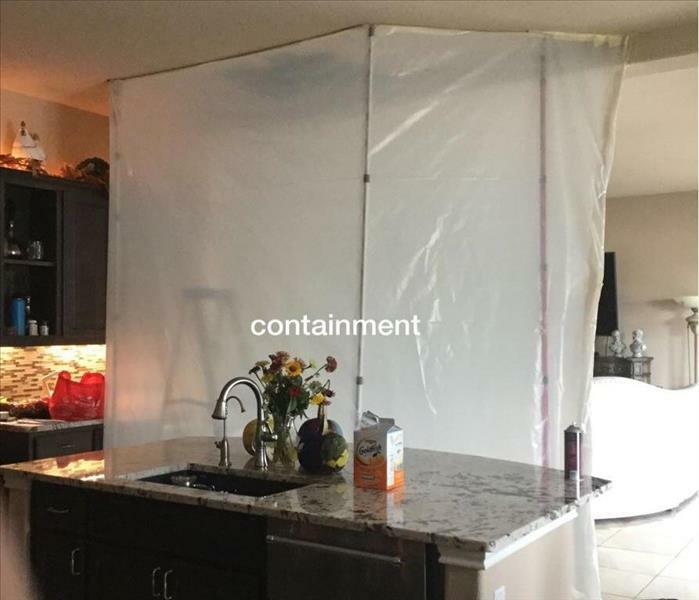 This is a dust suppression containment that SERVPRO of South Austin set up in a clients homes. 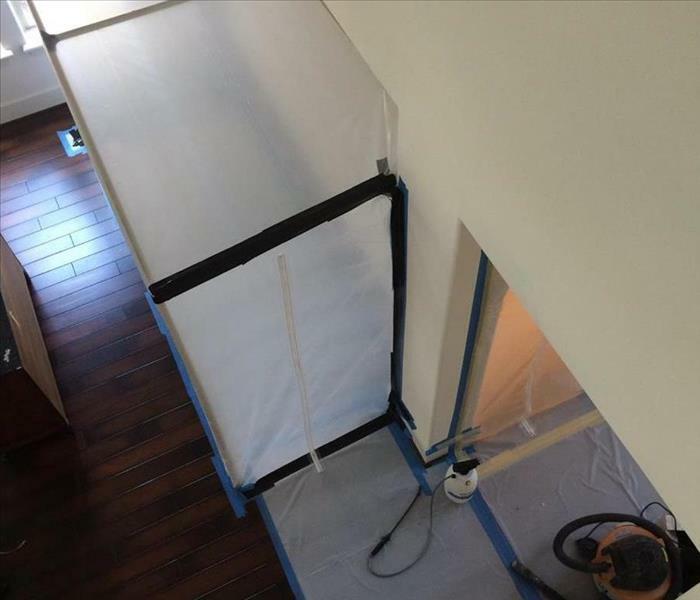 These contaiments prevent dust and debris from working areas to permeate into clean areas of the home. Attention to detail is paramount in order to prevent cross contamination.